“Relax into perfection” is not a mere slogan, but a practical approach. The ground of ultimate reality (Skt. alaya, Tib. kun gzhi) is none other than Buddha Nature, Great Natural Perfection. The path entails not a fabrication of what is missing, not an addition to what is lacking, but rather a separation from the confusion and agitation that impede the full manifestation of our Buddha Nature. The path is the cessation of the fluctuations of consciousness, by allowing the practitioner to settle into the ground of ultimate reality. Through precepts and observances (yama and niyama), we settle the fluctuations of gross actions. Through physical steadiness (asana), we settle the body. Through breath control (pranayama), we settle the energies. Through withdrawal (pratyahara), we settle the five sense-consciousnesses. Through concentration (dharana), we settle the mental consciousness. Through meditation (dhyana), we settle the appropriating consciousness. Through absorption (samadhi), we settle the ground consciousness. Beneath and beyond the ground consciousness (alayavijnana) is the ultimate reality, the ground of all (alaya). Just as in the physical world there is gravity that attracts all bodies, so in the path there is a force that promotes our settling into perfection. 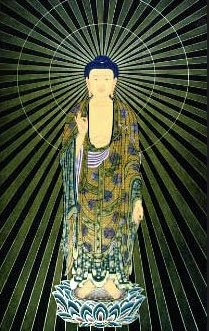 This force is the blessing of the Buddhas (adhistana).